The New Jersey Supreme Court has finally brought some clarity and sanity to the Truth-in-Consumer Contract, Warranty, and Notice Act (TCCWNA). Clarifying the requirements of TCCWNA has been priority of NJCJI for years. By providing a $100 penalty per violation of a “clearly established” legal right to aggrieved consumers, the statute has been a great business model for entrepreneurial attorneys who combine the statutory penalty with the class action device to threaten massive awards and extract settlements. Indeed, at oral argument in this case, plaintiff counsel affirmed that this was potentially a billion dollar case. 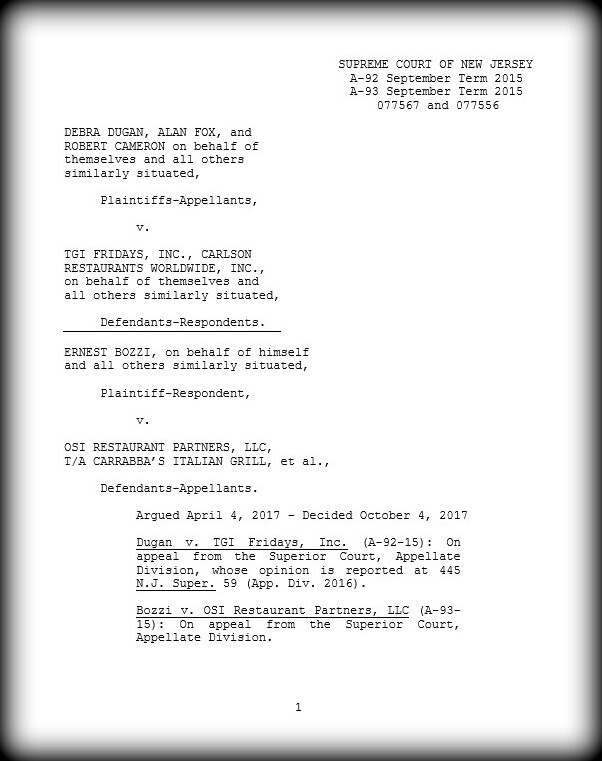 NJCJI filed an amicus brief in the highly anticipated pair of cases, Dugan v. TGI Fridays, Inc. and Bozzi v. OSI Restaurant Partners, urging the Court to address what it means to violate a clearly established legal right, and who is an aggrieved consumer. The Court responded by placing meaningful and much-needed limits on some of the most egregious TCCWNA suits. Justice Patterson authored the court’s 5-1 majority opinion, which was joined by Chief Justice Rabner and Justices LaVecchia, Fernandez-Vina, and Timpone. Justice Albin dissented. Who is an “aggrieved consumer”? The Court embraced NJCJI’s argument that only “aggrieved” consumers have standing to sue for civil penalties under TCCWNA, and that at a minimum, consumers who have not even been exposed to the allegedly offending drink menu are not “aggrieved.” The Court further agreed that determining which consumers meet the statutory standard of “aggrieved” requires an individualized inquiry that would preclude class certification in this case. The Court did not reach the question of whether an aggrieved consumer must also have read or relied on the presented menu. But in holding that the “aggrieved” statutory language requires a higher standard than consumers in general, the Court established that is not enough for a purported class to proceed on an allegation of some generic violation against the general public, and flatly rejected the suggestion that class members could demonstrate that they were individually “aggrieved” in a post-verdict claims process. What are “clearly established” legal rights? Several TCCWNA cases have been pending at the Appellate Division, awaiting direction from the New Jersey Supreme Court. We are hopeful that the guidance provided in this decision will help resolve these pending cases, and also discourage future TCCWNA shakedowns. The Court has also accepted a certified question from the Third Circuit Court of Appeals regarding the standards for “aggrieved consumer” and “clearly established legal right.” NJCJI filed an amicus brief addressing those questions. We should know shortly whether the Court proceeds to address those questions in a separate opinion or simply references the guidance provided in Dugan. Thank you to Gavin Rooney of Lowenstein Sandler and Jeff Jacobson of Kelley Drye for their work on this case on NJCJI’s behalf. If you would like to support this or other legal reform efforts, please contact NJCJI’s President & Chief Counsel, Alida Kass.